US President Donald Trump and China's President Xi Jinping. File Photo Credit: White House video screenshot. (FPRI) — Palm Beach heaved a collective sigh of relief as Chinese President Xi Jinping’s plane lifted off from the county airport. Gone were the noisy cheers of his supporters and the anti-Xi banners and jeers of Falongong practitioners, human rights advocates, and admirers of Tibet and Taiwan. The Palm Beach Post reverted from moment-to-moment briefings from the chief of police on street blockages and security precautions to issues of more immediate concern like rip tides and coverage of the Master’s golf tournament competition. Members of Trump’s exclusive Mar-a-Lago private club, whose initiation fee had doubled to $200,000 after his election, could now return to accessing the privileges for which they had paid so handsomely. Elsewhere in the country, attention was diverted from the eagerly anticipated meeting of the leaders of the free and not-so-free worlds by the U.S. president’s decision to order missile strikes on Syria in retaliation for Syrian President Bashar al-Assad’s sarin gas attack on civilians who opposed his government. The nation was also focused on the bruising confirmation process that recently ended in the confirmation of Trump’s nominee, Neil Gorsuch, as associate justice of the Supreme Court. Outside the United States, others were relieved as well: in Japan, America’s closest Asian ally, there had been fears that the Trump administration would attempt to use “the scent of a ‘huge deal’ with China” as leverage to extract concessions from Japan. It is imperative that the two sides share a common understanding of China in order to deal with a range of issues including crisis response on the Korean peninsula, Russian expansionism, maritime security in the South China Sea, strengthening strategic ties with India and Australia, and responding to Xi’s One Belt, One Road (OBOR) economic initiative. Xi and Trump announced no agreement on trade, with Trump and Japanese Prime Minister Shinzo Abe exchanging a 45-minute telephone call just after Xi’s departure that seemed to allay these concerns. U.S. Secretary of State Rex Tillerson shakes hands with China’s President Xi Jinping. Photo Credit: US State Department. Taiwanese were likewise reassured that their country would not be used as a bargaining chip. Their hopes that the new administration would support the desire of the overwhelming majority of citizens to remain separate from China had been buoyed when newly-elected Trump accepted a congratulatory telephone call from Taiwanese President Tsai Ing-wen then jolted when he announced on a Sunday morning television show that the One China Policy was not sacred. Trump implied that the policy—and their country—could be used as a bargaining chip in trade negotiations. Trump’s later statement that he had acceded to Xi Jinping’s wishes and now accepted “our” One China Policy only partially alleviated these concerns, with some Taiwanese pointing out that “our” could be his and Xi’s understanding of the policy, not that of the United States. They feared that a so-called Fourth Communique would be forthcoming, in which Trump would again accede to Xi’s wishes by agreeing that there is but one China and that Taiwan is part of it, instead of the U.S. longstanding policy that it acknowledges the Chinese view but not that it accepts that view. In the days before the Mar-a-Lago meeting, U.S. State Department officials assured their Taiwanese counterparts that no Fourth Communique would be forthcoming. And in fact it was not. If Taiwan were mentioned at all, there was no public mention of it. A number of other things did not happen. Unusual among such high-level gatherings—the White House had earlier pointedly referred to the impending visit as a “meeting,” rather than as a summit—it did not conclude with any joint communique, much less one that mentioned Taiwan. Also absent, to the great relief of those who feared that the man who regarded himself as master of the art of the deal would “accede to Xi’s wishes” once again, there was no mention of the Chinese code words that Secretary of State Rex Tillerson had been heavily criticized for using during his earlier trip to Beijing: a “new model of major-power relations” and “win-win cooperation for mutual benefit.” Had Trump explicitly endorsed these principles, it would be seen as an important diplomatic gain by Xi, since implicitly he would be accepting China as a partner rather than a rival. On a less lofty plane, but still remarked upon for its symbolism, it was noticed that Xi, who arrived in Florida after a visit to Finland, had offered pandas to the Helsinki zoo, but did not mention them while in the United States. Chinese newspapers were nevertheless upbeat about the gathering, with official news agency Xinhua describing it as “yet another historic moment in the development of U.S.-China relations.” The two leaders had exchanged views on mutual relations, on major international and regional interests of mutual concern, deepened their understanding of each other, improved mutual trust, reached many consensuses—which, however, Xinhua did not specify—and laid a constructive tone for future development. Xinhua continued with a series of what it described as old Chinese sayings whose metaphorical meanings may not be immediately obvious to outsiders. What, for example, did Xinhua have in mind by saying “The glory of sun and moon does not come at the same time, since one shines in the day and the other shines at night?” One might be tempted to conclude that Xinhua, which operates under close state supervision, was saying that the two sides were polar opposites that could not co-exist, or to wonder which country the Chinese government regarded as the sun and which as the moon. Some Chinese citizens clearly did not share Xinhua’s rosy view of the meeting. On learning that Trump had informed Xi at dinner that he had earlier ordered a missile attack on Syria, social media referred to this evidence of disrespect as “the banquet at Hong Gate,” a tale of attempted assassination in which a second century B.C. leader invited his rival to a feast as a pretext to kill him. 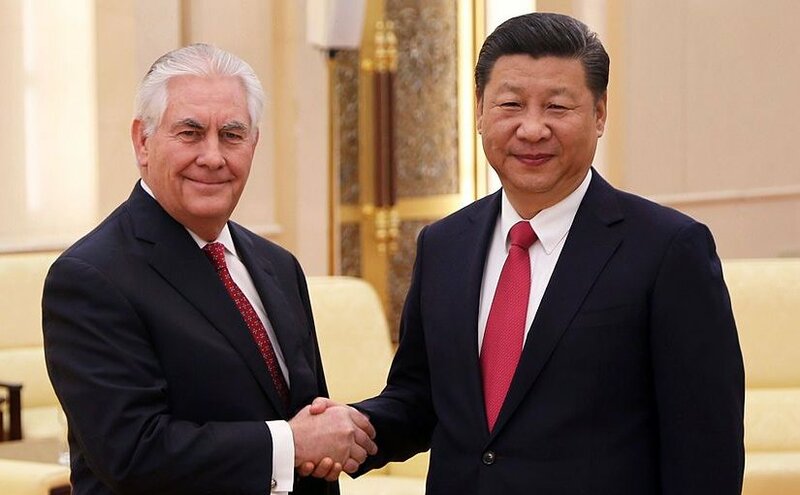 Although Rex Tillerson said that Xi had indicated his understanding of the missile attack on Syria since it had killed children, and the Chinese media were initially silent on the matter, as soon as Xi departed, they criticized it as yet another example of the American hegemonistic tendency to interfere in the affairs of others. Tillerson did, however, add that the two leaders had had a full and frank exchange of views, diplomatic language indicating that the two had had significant differences of opinion. Still, he—not Trump or Xi—said that China had pledged to do more to rein in North Korea’s proliferation of weapons of mass destruction. And that Xi had agreed to a hundred day plan for trade talks aimed at increasing American exports and reducing the PRC’s trade surplus with the U.S.
What will come of these plans remains to be seen. Xi Jinping cannot afford to be seen as a loser in his dealings with the new U.S. president. The Chinese economy is slowing down, Beijing is worried about the problems that a collapse of its North Korean client state would have for China, and Xi is facing high-level domestic resistance to his ambitious efforts to centralize decision making in his person. These discontents are expected to crystallize ahead of the 19th Congress of the Chinese Communist Party, scheduled for this coming fall. Nor can Trump be seen to have retreated from his tough campaign rhetoric on dealing with China. As Xi was leaving, a carrier strike force led by the USS Carl Vinson left Singapore for the Korean peninsula. Ironically, the Chinese government had exactly one year earlier denied the Vinson a previously-arranged port call at Hong Kong. If Xi is to do something to forestall what U.S. Ambassador to the United Nations Nikki Haley threatened last week—that if China does not act on the North Korea issue, then America will take action alone—now is the time. 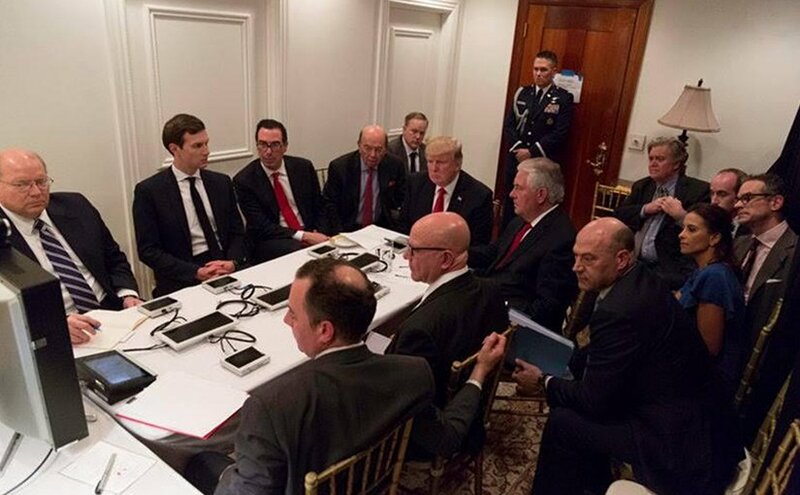 US President Trump briefed on the situation in Syria. Photo Credit: White House. The bombastic rhetoric that many feared would disrupt the meeting/summit did not happen. Trump’s grandchildren sang Chinese songs to their visitors, as he praised Madame Xi’s beautiful singing voice. Not known for his modesty, particularly as a negotiator, a smiling Trump remarked to reporters during the dinner “I got nothing, I got nothing,” perhaps wanting to soothe the blow of the news of the attack on Syria. If Xi were insulted, it did not show. Rather than depart U.S. airspace immediately, he stopped in Alaska for a carefully scripted pre-arranged “surprise” stop in which he met with Governor Bill Walker to discuss the possibility of trade deals, training Chinese athletes in Alaska for the 2022 Winter Olympics, and establishing tourist exchanges. There was speculation that an underlying motive was China’s desire to play a larger role in the management of Arctic waters, given the country’s burgeoning shipping industry and the increasing accessibility of the polar transit route due to global warming. And the China Daily announced that the PRC’s CRRC Corporation had just secured an order for 1,359 subway and commuter car orders from Boston, in addition to other deals in Chicago, Philadelphia, and Los Angeles. In the end, the meeting/summit may be viewed as a draw. Each leader was able to size the other up. Trump accepted Xi’s invitation to visit, at which point China will have the home court advantage. By then, we should see whether any progress has been made on the issues between them. *June Teufel Dreyer is a Senior Fellow in FPRI’s Asia Program. She is Professor of Political Science at the University of Miami, Coral Gables, Florida. The 1979 Shanghai Communique in which China and the U.S. established the basis for future diplomatic relations; the 1978 Communique in which formal diplomatic relations were established, and the 1982 Communique in which the United States agreed to gradually reduce arms sales to Taiwan so long as relations between the two sides of the Taiwan Strait remained peaceful.